One of the best things about summer is going to a farmers market. 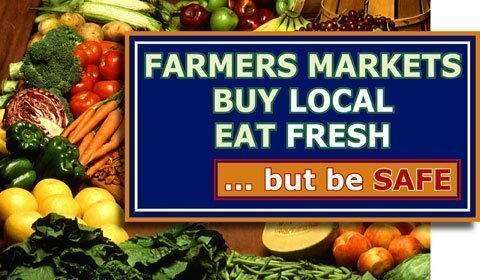 Depending on where you live, you may have access to a farmers market year round or they may just now be opening up for business. Either way, it’s always a treat to walk by the array of vendors, and decide what to buy from among various produce, baked goods and other edible foods. What is not a treat is being exposed to a foodborne illness. Buying locally-grown and organic foods is encouraged, but don’t think they are impervious to a food safety hazard. No matter where you buy your food, always be mindful of the potential for biological, physical or chemical contamination that could cause harm. Biological contamination includes microorganisms that cause foodborne illness, such as Salmonella, Staphylococcus aureus and E. Coli 0157:H7. Physical contamination can be in the form of foreign material such as rocks, glass, insects and dirt. Chemical contamination refers to agricultural chemicals used in the production of food, such as insecticides and fungicides. Out of these three possible methods of contamination, biological hazards cause the most harm and illness to people. Get to know the grower. They will be your best source of information concerning what types of pesticides they use, if any, and how they harvest and keep their produce safe from bacteria. Ask them questions such as how to tell when the produce is ripe and how to store and prepare it. Always wash produce. First, wash your hands with soap and warm water for 20 seconds before handling fresh produce. Then, wash fruits and vegetables under cool running water before eating or preparing them. It is not necessary to use soap, detergent or commercial produce washes. Even produce where you don’t eat the peel, such as melons, need to be washed – there can be dirt or bacteria on the surface that gets transferred to the inside when you cut through it. All cut or peeled produce needs to be covered and refrigerated. Take special precautions for milk, juice or ciders. A key question to ask: “Is it pasteurized?” Pasteurization is a process that kills harmful bacteria without reducing the nutritional content of the food. Unpasteurized milk, juice or ciders could be contaminated with Salmonella, E. coli 0157:H7, Listeria and Campylobacter, placing anyone, particularly those with a weakened immune system, at risk. Pasteurized milk, juice or cider will still need to be refrigerated as they can contain low levels of nonpathogenic bacteria. Keep eggs edible. Ask if the eggs are being kept at 45 degrees F while at the farmers market and always open the carton to check for dirty or cracked shells. Maintain meat freshness. All meat being sold needs to be kept chilled below 40 degrees F in a closed container. Bring your own cooler or insulated bag to keep it cold when returning home. Keep meat separate from other food as juices from raw meat can contain harmful bacteria, contaminating food like produce. Once home, freeze or refrigerate meats immediately. This summer growing season and year round, always be mindful of preventing a foodborne illness. By following the five tips listed, the risk of a foodborne illness can be significantly reduced, making going to a farmers market an enjoyable highlight of shopping for food. This summer, take advantage of the fresh, locally grown produce and other foods farmers markets provide. Sources: Kansas Department of Agriculture; Lutz, C., Mazur, E., Litch, N. 2015. Nutrition and Diet Therapy. Philadelphia:F. A. Davis Company; Grosvenor, M.B., Smolin, L.A. 2012. Visualizing Nutrition Everyday Choices. Hoboken:Wiley.